There is little doubt that Doug Kershaw is the most famous Cajun entertainer in the world. His career stretches back more than fifty years and includes stints on the Louisiana Hayride and the Grand Ole Opry. He's shared the stage with country music legends Johnny Cash, Bill Monroe, and Roy Acuff, as well as rock stars like Elvis Presley, John Lennon, and Eric Clapton. 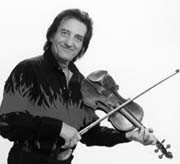 He appeared on television as early as 1953, scored his first hit record while he was still a teenager, performed in a movie with shock rocker Alice Cooper, and earned his nickname The Ragin' Cajun with his dynamic stage performances during which he would go through two or three violin bows during the course of one song. He's written dozens of songs, including "Louisiana Man," which has become a Cajun anthem. And all of his success began with the fiddle. Doug Kershaw was born on January 24, 1936, in Tiel Ridge, Louisiana, a place he says was not a town as such, but was instead a section of coast on a small island where you could tie up your houseboat. His family was poor, but they all played music. His mother Rita played guitar and fiddle, his father Jack played accordion, and his older brothers played as well. "I started on fiddle when I was five years old," he says. "I don't remember taking any lessons, but I did grow up hearing the fiddlers that would stop by to play with my folks, so I just sort of always knew what to do." In 1945, at the age of nine, Kershaw made his debut as a fiddler on the small bandstand at the gruesomely named Bucket of Blood tavern in Lake Arthur, Louisiana. The place was scary- the stage was protected from flying beer bottles by a chicken wire screen- but his mother Rita was right there with him playing her guitar and ready to step in and help out if he got nervous and forgot the tunes. That night they played a few waltzes and two-steps, and sang some songs in the Cajun French they spoke at home. Not long after his debut, Kershaw was playing regularly with his mother and a local musician named Zenis LaCombe. "We were called the White Shirt Band," he recalls. "Then I formed a band with my older brother Pee Wee and my younger brother Rusty. We called ourselves the Continental Playboys. Pee Wee played accordion, Rusty played guitar, and I played fiddle. But we switched instruments around quite a bit, which is why I can play so many instruments today. I think I can play twenty-nine different ones these days. But fiddle has always been my main instrument from the beginning." The Continental Playboys played bars and dances around the Lake Arthur area, and eventually they wound up as regulars on radio station KPLC. "We learned songs from local musicians like the fiddler Will Kegley," he recalls. "But when we started playing the bars, we also began to learn the songs off the jukeboxes. We didn't have a radio or record player when I was growing up, so the jukeboxes were really important to me. I would hear Cajun things by Henry Choates, country singers like Ernest Tubb, and big band stuff by Glenn Miller. And I learned to play it all. I still love to play "Stardust." You know, there were no labels on the jukebox-it wasn't country or jazz or Cajun-it was just music." Throughout the 1960s, Doug Kershaw worked to get his career as a solo performer going. He made a few records for Mercury and MGM, but they didn't really go anywhere. In 1969 he released The Cajun Way, his first solo album for Warner Brothers. "That album got me an offer to appear on the Johnny Cash Show on television," he recalls. "They gave me a choice: I could play seven shows, and become one of the studio musicians, or I could be on the premier show and have one big solo spot. I decided that I would go for the solo spot. I knew if I was going to be a solo performer I would have to compete with people like Johnny Cash and Bob Dylan, who was also on that show. I gambled and I won. That show introduced me to a whole new audience. I had been a country star in the '50s with my brother Rusty and I had some success in country as a solo performer. I thought I knew what it was like to be a star, but I just had no idea. I went from playing the Opry with Bill Monroe to playing at the Fillmore East with Eric Clapton. And it proved what I always felt, that I could play my music for any audience, not just a country one." Kershaw dressed in a velvet Edwardian suit and billed himself as the Cajun Hippie. "I was playing rock clubs, colleges, festivals," he says. "I was bringing my music to a whole new audience, and they really loved it." During the early 1970s he played on records by all sorts of musicians, including Grand Funk Railroad, Bob Dylan, and John Stewart. He also got a few minor roles in movies, including "Zachariah," a counterculture western, "Days of Heaven," and the concert film "Medicine Ball Caravan," which was also known as "We Have Come for Your Daughters." Between 1969 and 1978 he released eleven albums on Warner Brothers. His blend of Cajun, country, and rock was popular with his audiences, but his label wasn't really sure how to market him. "They transferred me over to the country division in Nashville when they opened it in the mid-1970s," he says. "I was playing for people in rock clubs and the Nashville people didn't know what to do with me." Kershaw left Warner Brothers at the end of the 1970s. Over the next few years he made records for a variety of companies and occasionally made the charts, but he never again had a hit as big as "Louisiana Man." But his wild stage shows continued to draw big crowds. He is a powerful fiddler, who can wear out the hair on two or three bows during the course of one song. "I do go through a lot a bows when I play, particularly if I'm using horsehair," he says with a laugh. "I find that synthetic hair is a little more sympathetic to me. Synthetic hair doesn't sound as good, but it does wear better. But sometimes I do like to use horsehair for the show of it, just to see the hair waving around when I play." He will also loosen the bow hair, slip the stick under the fiddle, and use the hair to play on all four strings. "I wanted to play chords on the fiddle when I was a kid," he says. "When I was maybe ten years old I kept filing the top of the bridge down until it was flat, but then I found that although I could play on all four strings, I couldn't play on just one anymore. So I said the heck with this and loosened the bow hair, put the stick under the fiddle, and found I could play them all. I'm sure I wasn't the first person to come up with that, but I was probably the youngest one to do it." Kershaw is still making records. In 2000 he made Two Step Fever, his first recording of songs in French. "My wife had been after me for twenty-five years to do a Cajun French album," he says. "I have to tell you at first I was kind of leery about doing it, because I didn't want to fall back into the sort of music I played when I first got started. But then I figured at this point in my career I could do what I wanted to. So I went back to Louisiana with some old friends of mine and we just sat down and played. It was just a wonderful feeling to sit and just play that stuff again. I tell you, there's some real life on that album. It really gives people an idea of where I came from. In 2002 I released Easy, a CD that has a more contemporary, honky tonk feel than Two-Step Fever. It's got nine original songs and I'm really happy with the way they came out." Doug Kershaw has great commercial success, but many aficionados of the traditional forms sniff that he has lost his Cajun soul in the process, that he has more Branson in his playing than bayou. But Michael Doucet, the most respected Cajun fiddler out there, begs to differ. "I've known Doug for twenty years," he says. "Some people dismiss him as just a showman who does a lot of crazy things on stage, but that's not the whole story. Don't forget, he came up the hard way. He was real poor when he was growing up and he played those little bars with the chicken wire around the stages when he was just a kid. The things he sings about in "Louisiana Man" may sound romantic and rural, but that's the story of hard life. You can't fault him for wanting to have more than that. You know, I've played with lots of old-timers and they all have their own rhythm, and when I've played with Doug, he has it, too. It's an amazing amalgamation of notes, melodies and rhythms that you can't fake. He's sixty-five now and he was around when a lot of the great Cajun musicians like Harry Choates, Nathan Abshire and Iry LeJeune were still alive and recording. He knew them and learned from them. He has this commercial side, but he can also play the old songs with a funky, rhythmic drive that's just amazing. He's the real deal."